I'll keep this one short after yesterday's run-on! Just 3 links to 3 events that are coming up in May. 1st one I posted yesterday but I'm just reposting in case somebody didn't make it all the way to the end. This one's for the music lovers. It's this coming Saturday, May 3rd, at 3 PM at the BMCC Tribeca Performing Arts Center. The Mālama Honua Showcase includes music and dance from all over the Pacific, plus some Native American performers, all performed by NYC locals - should be a great afternoon. Click here for details. In mid-May, Nainoa Thompson, the president of the Polynesian Voyaging Society and Lead Navigator of the Hōkūle`a, will be visiting NYC, along with other members of the PVS and educators from Hawai'i. There will be 2 events on May 16th. The first one is for educators. The Worldwide Voyage Educator Institute will be held from 1 to 5 at NYU, at it sounds so interesting it almost makes me wish I was a teacher (although I know that teaching is a hard and often thankless profession). Click here for more info. The second is in the evening. This one's a cocktail reception fundraiser at the Harvard Club, and this one's for anyone who's interested in meeting Nainoa, learning more about the PVS, vessel, and the voyage, and lending financial support to the NYC visit. Click here for details. 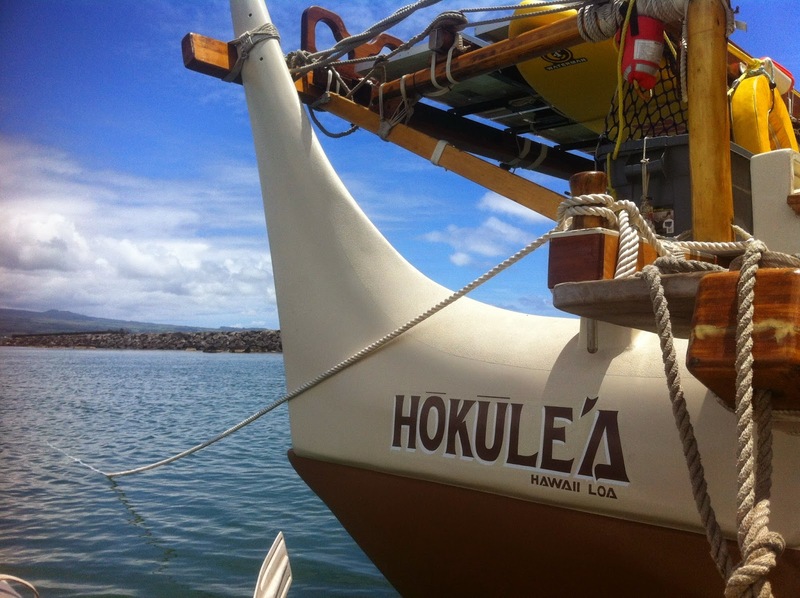 Hālāwai is leading the planning in the greater New York area to prepare for the arrival of Hōkūle`a, including outreach to Native Americans and other groups and to schools on all levels and other institutions of scientific learning and culture so that we can help fulfill the mission of the Mālama Honua Worldwide Voyage. We have various committees who are focused on the major efforts and who have begun planning! If you are interested in joining us, particularly if you would like to work on a committee or can help us with outreach, please let us know via our contact page. Welcoming the Hōkūleʻa to the Northeast - Summer '16, but the preparations have begun! Welcoming the Hōkūleʻa Crew to NYC - She won't be here until July 2016, but the preparations have begun, and I'm very happy to be part of the welcoming committee. I did a whole series of Facebook posts today, which I'll just lift for blog posts over the next couple of days. Last December, I think it was, I got an email from Rob Buchanan (who's very active with the Village Community Boathouse and the New York City Watertrail Association, and whose New York Harbor Beaches was a key inspiration for the New York City Watertrail) that just about made me fall off of my ergonomic office chair. He was going to a preliminary meeting of a committee that was forming up to help welcome the Hōkūleʻa to NYC in the summer of 2016. Did I want to come? 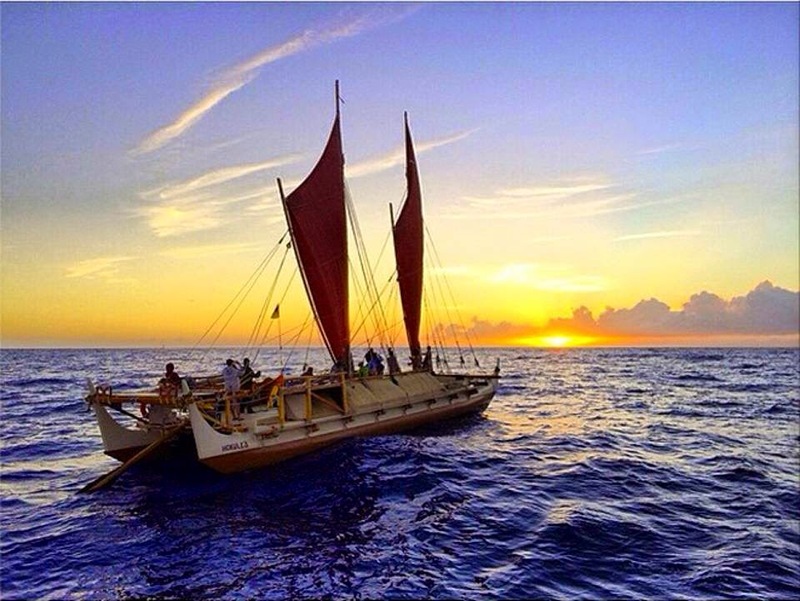 The voyaging canoe Hōkūleʻa was launched and did her first voyages when I was a kid growing up in Aiea. I wasn't as boat-crazy then as I am now, spent a lot more time in the water than on it back then, and I didn't follow that closely (also this was pre-internet, so you couldn't just sign on to the Hōkūleʻa Crew FB page every morning to see what was going on! ), but I so clearly remember the pride people there felt as Nainoa Thompson brought the then-vanishing Polynesian art and science of wayfinding (which he learned from Mau Piailug, who at that time was one of the last traditionally trained navigators of the Pacific) back to Hawaii, where it had been lost for generations. Forty years later, Nainoa is the president of the Polynesian Voyaging Society, and Hōkūleʻa travels on. Last year, she launched on a voyage like none she'd ever done before - a multi-year trip around the world! I've been following the Mālama Honua Worldwide Voyage since then. At the time I got the invitation from Rob, I actually didn't know she was coming here. The original version of the map on the Worldwide Voyage website (click here for that) had showed her turning around somewhere around Virginia. I was SO disappointed to see that, I think I even said something on Facebook about how sad I was that she was coming so far on her first trip beyond the Pacific, and then turning around without a visit to New York Harbor. Of course I was absolutely thrilled to find out that was all preliminary and she really was coming here, and I'm so excited to be part of the welcome effort. Can't wait to see that vessel that's so familiar from my youth sailing under the Verrazano Narrows Bridge - hopefully I'll be out there as part of a flotilla of all of the kayaks, canoes and rowboats in the area. Lots to do before then though! I hadn't said much before this because everything was really, really preliminary, and the welcoming committee, which is being led by some wonderful folks from Hālāwai, a local not-for-profit that works to bring Hawaiian cultural events to NYC (including the big ho'olaule'a for New York Outrigger's annual Hawaiian Airlines Liberty Challenge - NYO is also very involved), had to coordinate with the Polynesian Voyaging Society. Now that things are coming together, I can start talking about what's going on more! The first official event, the Mālama Honua Showcase, is actually coming up on Saturday the 2nd, starting at 3 pm in Tribeca -- it looks like it's going to be a really amazing performance. You can read more about the show and order tickets here. Don't miss the invitation to participate in the preparations - anyone (or any group) who'd like to join in is welcome! 5/1/15 Update: So it seems maybe the normal Spring boating accident wasn't a normal Spring boating accident. The woman who was fished out of the Hudson has now been charged with murder.Most complete writeup I've seen so far here. The New York State off-season lifejacket rule -- the one that says anyone who's out in any recreational vessel of 20 feet or less must be wearing a lifejacket between November 1 and May 1 -- is still in effect. We've got another nice weekend coming up here, if not quite as balmy as last weekend, but the water's still quite cold. Immersion gear (wetsuit or drysuit) is still a very good idea if you are going boating, but at the very least, please wear your lifejacket. Because stuff like this doesn't need to happen. NYC. 4/22, 10:45 PM. Thank goodness for the right subway busker at the right time. I left work tonight after my computer shut itself down at 9:10. I'm swamped with forecast requests and if that hadn't happened I might have stayed much later. As it was, I decided the shutdown was my computer's way of saying "Go home, you have other stuffs to do tonight" (which I do -- more on that before much longer). I left the office feeling just plain jangled. I walked to the Broadway-Lafayette subway station. I swiped my card, pushed on through the turnstile, and as I headed for the stairs down to the platform, I heard the mellow notes of a sweetly-played trombone curling up the stairs to meet me. My shoulders immediately began to descend from the level where they'd been hovering tensely, somewhere around the lower line of my jaw. My train didn't come for I don't know how long. I don't know how long because with this gentlemusician pouring popular standards of the 30's and 40's into the air of the platform, it didn't matter that much. I leaned against a pillar and I leaned into the music and I let it massage the day's cares away. I applauded and donated (of couse - the musician is worthy of his hire). A few tunes later, the B train finally clattered into the station. I threw a last dollar in the basket and then stepped on board. The bell chimed and doors closed on the chorus of "Dream A Little Dream of Me" and the train pulled out of the station, leaving the musician and his gleaming trombone behind, but the music followed me all the way home. Happy Earth Day. I'm spending it my cubicle, of course, but here's a nice picture I have on my hard drive here. Don't you just look at this and think "That's SO New York City"? Glad we've got bits that still look like this, and that I get to play there as often as I do. 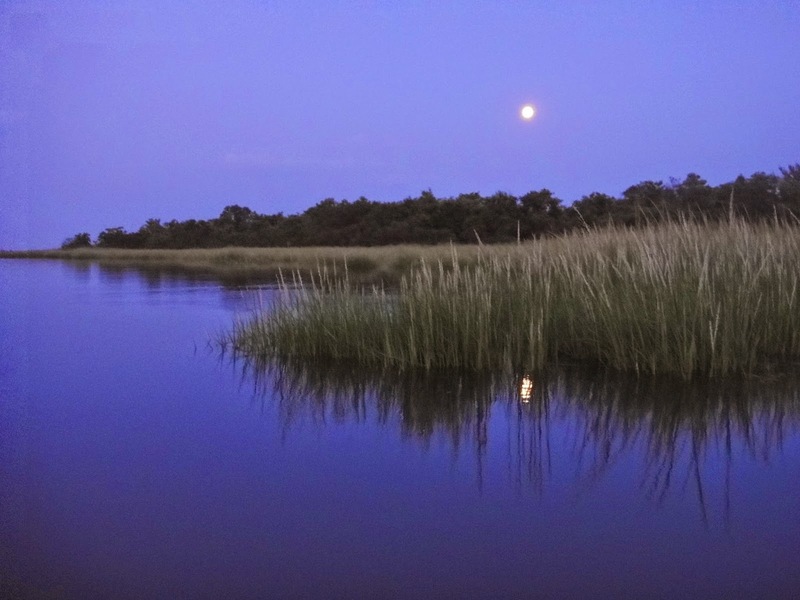 August 2013, Jamaica Bay. What a splendid Spring weekend in NYC! As usual, click on any picture for a better look. "Forget trees falling in forests. If I went for a paddle, and there wasn't a card in my camera, DID I REALLY GO FOR A PADDLE???" I think other people who came paddling with me will vouch for the fact that I really did go for a paddle, but I'm sorry I can't share pictures because it was a gorgeous day, we had a massive squad turn out to go out (I swear I counted thirty of us although the roster said twenty-seven), the Canarsie Pol ospreys are back, the CCNY Concrete Canoe Team is back in training and they were out practicing, there was a line of Lasers all rigged and ready to go when we got back, Patrick was sailing his Goat Island skiff around, tiny tug Emily and her crew were working on the slips at Diamond Point, and there was a purple, blue and yellow cake at the potluck. So many things to take pictures of and no card, boo. Wonderful day at the club though - I do enjoy the quiet of the bay in winter but it's always exciting watching things start to stir here at the start of the season. Great seeing all the folks back at the club (also great eating all of their good food, of course). Today I was going to stay home and try to get the apartment looking a little more civilized; it's budget season at work, and when work gets busy, my housekeeping, which never has been and never will be something I'm particularly proud of, really slides. I did get a little done but in the end I decided it was too nice a day to spend entirely on cleaning house and I decided to go see if I could find any nice ducks who wanted to have their pictures taken in Prospect Park. I didn't, because I got waylaid by warblers instead! I'd started my walk over by the Audubon Center. There were no ducks there, because there was a grand Earth Day concert going on on the steps featuring two young men leading an orchestra of children playing drums and vuvuzuelas they'd all made for themselves, while the nearby shore was lined with young anglers trying their luck with the fishing rods that were available to borrow. I took a few pictures there, then walked on down the Lullwater towards the lake in search of ducks. As I came out from under the Terrace Bridge, I spotted two birdwatchers (instantly recognizable by their field glasses and zoom lenses, much better than mine) who were intent on something. I looked to see what had their attention and saw it instantly - it was this gorgeous little brilliant yellow bird with darker wings, just beautiful. They told me it was a Prothonotary Warbler and that it was not usually seen in this area, being more of a southeastern bird - this one must have overshot its migration. Sad for the bird, I guess, since there won't be a lot of lady Prothonotary Warblers up here to impress (although in a post-posting update, my birder friend Prof. M just told me that she was out birding in Prospect Park today too and she saw 2 of these birds, and also that when they do end up here, they will figure it out and backtrack to their proper breeding grounds), but what a treat. There were more birders across the way, the two who'd been looking at the Prothonotary told me they were watching a Yellow-throated Warbler, which is also considered unusual for the area. I caught a glimpse of that one but our little yellow bird was just hanging out in our area so I ended up just staying there for a bit. Eventually I did decide to move on; I made it as far as up on top of the bridge I'd just been standing next to when I spotted a couple more cute little bird, who turned out to be a yellow-rumped warbler - not unusual, from what I see in the All About Birds site run by the Cornell Lab of Ornithology (very nice site! ), but a striking little guy, and a Ruby-Crowned Kinglet, who was a very tidy-looking little bird with just a spot of scarlet at the back of his head, which was a bit of the red crown that the site says they will show off when they're singing. I spent quite a while enjoying watching them and trying to get pictures (fast-moving little guys, I got a few good shots and then a whole lot of empty branches where there had been a bird a split-second earlier). There was still plenty of daylight left when I was ready to move on from there, but I'd gotten a little splinter that just doesn't want to come out in the ball of my foot a couple of days ago and although I'd thought maybe it was gone when I got up this morning, it wasn't, and it was starting to complain, so I decided to save the ducks for another day and head for home. Thoroughly enjoyed being waylaid by warblers! Boating season that is, fa la la la la! Great weather for a couple of work days at the club this weekend, and we got lots done. Next Saturday is opening day, hooray hooray, hope the weather is as cooperative! I attended the Saturday work day and although mostly I was working, of COURSE I brought my camera along and took a couple of picture-taking breaks. Unfortunately, I missed the Concrete Canoe Team (no, I'm not joking, we have a terrific crew of engineers-in-training training for the big annual Concrete Canoe Competition) but I did get some nice shots of the Saturday workers. Can't you just feel the anticipation after that loooooong winter we had? The rest of this post is all pictures - click on the first one for the slideshow view. 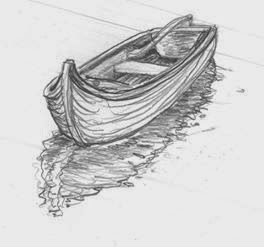 but then you suddenly have to draw a boat? OK, that doesn't happen to me all the time, but I hadn't done any of my more ambitious attempts at drawing or painting lately -- I mean as opposed to doodling on any non-crucial piece of paper that comes in reach while I have a writing instrument in hand, which is pretty much a perpetual thing -- so when I got to feeling like breaking out the sketchbook last night, I ran with it, even though it was pretty late and I was meeting a friend to go out to the club workday today at 8:30 am so couldn't really sleep in. Sean saw that and said, "Hey, that's pretty nice. How about trying the Araner?". 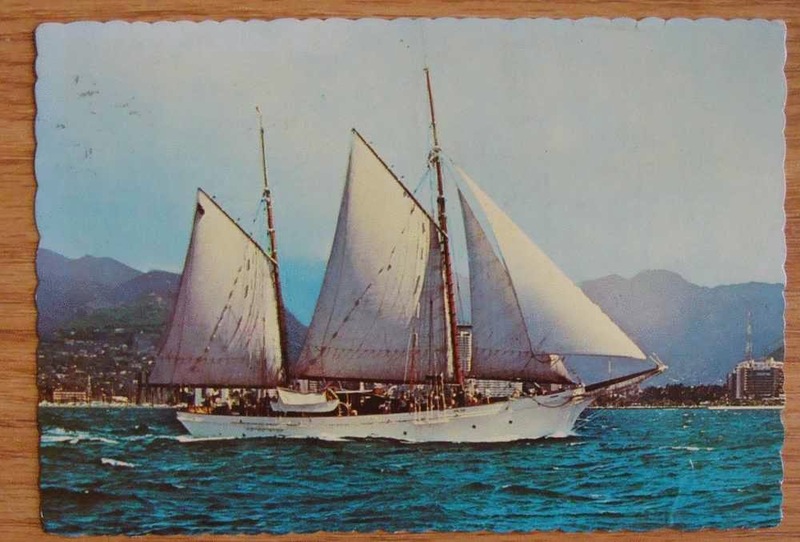 The Araner was a very handsome ketch that Sean worked on for a time years ago; he shared this postcard, which I looked at and said "Ooh, yes, I think I would like to try to draw that". Didn't get to it for a couple of weeks, although there was one doodle at the desk one where I tried to just sketch the quickest outline of her lines from memory - that was pretty funny because when I finished it I looked at it and said to myself "You tried to make her into a schooner!" - somehow even though the front mast was taller, I still managed to make the aft sail the largest. Last night's stab went a little better; this time, with the postcard onscreen, I managed to make her NOT look like a mutant schooner. Good start - hopefully I will get myself to come back to this, she's a nice-looking boat and it would be fun to do a cleaner version. Easter Sunday Swim 2015 - photos! 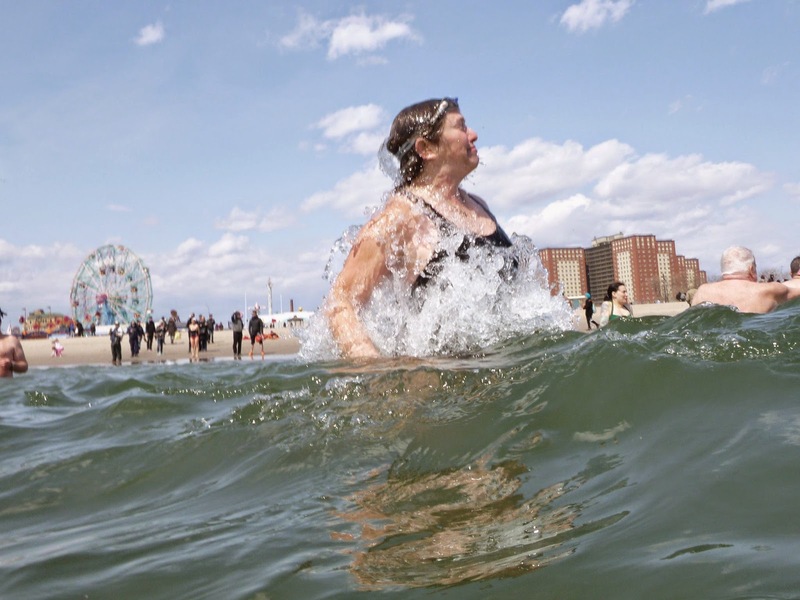 So yes, I had so much fun going for an Easter Sunday swim with the Coney Island Polar Bears last year that I decided to do it again this year. I think it was a good bit colder this year, I probably would have been better off if I hadn't actually looked at the Stevens Institute NYHOPS site a couple of days before, but since I'd already stated publicly that I was going swimming on Easter Sunday, it would've taken a really good excuse to bail, and I failed to find one. I had a great time although if you think you detect a note of "oh $#!+ it's cold!" in my expression in this shot by regular Coney Island Polar Bear photographer Bruce Handy, you would be absolutely, positively correct. Love the shot though! I did take some pictures myself and put together a Flickr album of the afternoon's fun - click here if you want to check that out! And if you liked this photo by Bruce Handy, you can see lots more of his Coney Island photos Amusing the Zillion. Short Rib Saturday - I MADE KALBI! Quick post after a long week at work, just to say "I'm still here" and also share something else besides ospreys that I was REALLY REALLY HAPPY ABOUT this week. See that nice meal? 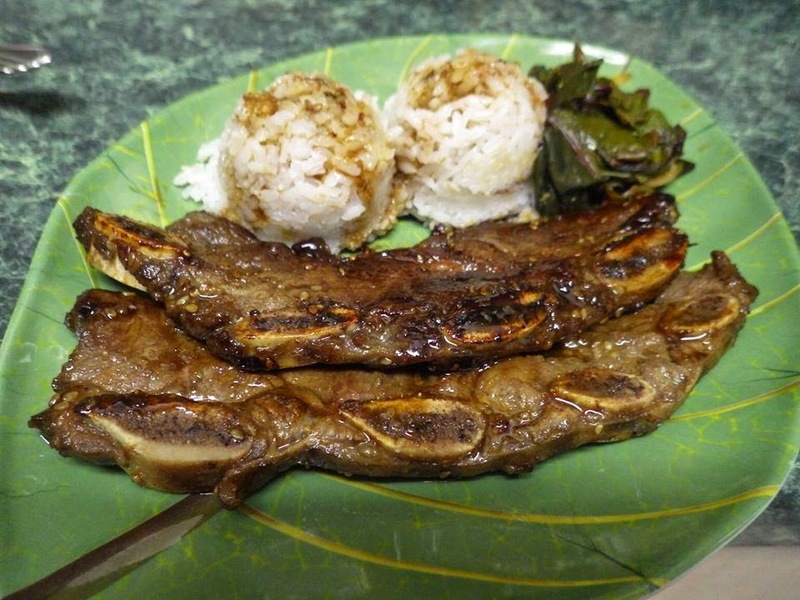 That was dinner on Saturday and that's proper Hawaiian-kine kalbi I cooked, as featured in many a fine Hawaiian plate lunch, including the one featured If Tillerman and Tillerwoman went to Hawaii they could try some new foods. I didn't get the Tillers to go to Hawaii but boy did I have fun writing that. 1. the L&L Barbecue in Manhattan (former NYC plate lunch source) closed. 2. Then my favorite Korean restaurant on the way home from work closed. 3. Then the Korean restaurant that wasn't quite as convenient as my old favorite Korean restaurant, but still close enough to be my new favorite Korean restaurant after my old favorite Korean restaurant closed, closed. Enough already. Time to make my own, yeah? I did a quick Internet search for kalbi recipes. Things don't always end up being cooked in Hawaii in exactly the same way they are in other places, so since I was after that taste from "small-kid time", I specified "Hawaiian style kalbi". I found a promising page and used the first of the 2 recipes. It's a keeper. Onolicious, and easy, too! Came out so well I had to serve it with two scoop rice, just like back at home, even though it was just for me this time. If I'd wanted to do a proper homage, I should've made some creamy mac salad with Best Foods mayonnaise, but I had some other things to do on Saturday, which was a little dreary and thus a good getting things done day - as it was I added some of the home-grown Swiss chard I froze at the end of last season. Pretty good dinner and I've been enjoying the leftovers through this very busy week at work. Have to keep this one in mind for a potluck sometime. I do love Ivory Hut's chicken adobo for a potluck, but this would be good too. Here's Sarah Vowell reading an excerpt about Hawaiian-kine plate lunch from her book Unfamiliar Fishes, which I finally read, and enjoyed, during my sailing trip in January.